T-U-R-T-L-E Power! Part 1: Turtles are Weird. As the meme goes: I like turtles! They are such a unique group of animals, that one can’t help but be drawn to them. Yet despite their uniqueness, turtles tend to get thrown into the wastebin of “living fossils”. It’s not uncommon to hear documentaries, or books refer to turtles as having been static since their first appearance 200+ million years ago. It’s unfortunate because statements like these tend to downplay just how weird and wonderful turtles really are. So why are turtles so weird? Well, as one might expect, it’s all about the shell. The turtle shell is an iconic image. Everyone knows what a turtle basically looks like. Even strange turtles like the mata mata (Chelus fimbriatus) are still recognizable as turtles. Contrary to popular belief, turtles can neither come out of their shells, nor does the shell act as their home. One cannot pull a turtle from its shell. The shell is the result of a phenomenal transformation of the backbone, ribcage, sternum, clavicles and gastralia. Turtle shells are different from the armoured “shells” seen on dinosaurs like the ankylosaurs. It is also fundamentally different from the armour seen on armadillos, crocodylians and every other vertebrate out there. In all these other animals, the armour is composed of bony plates that are formed from bone which is made intramembranously in the dermal portions of the body. Turtles are the only animals we know of that develop their armour by using this dermal bone in conjunction with endochondral bones (i.e.. the vertebrae and rib cage). 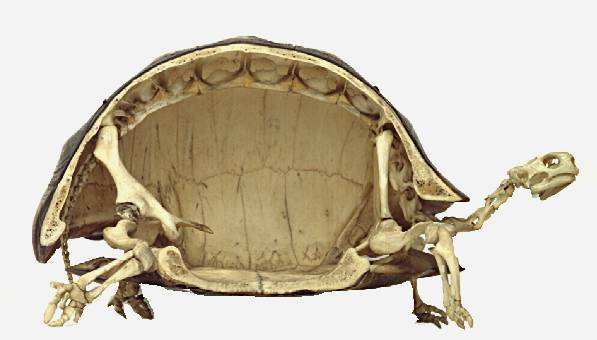 A turtle “coming out of its shell.” Image from the Encarta website. It is at this point that turtles go from simply being unique, to just being weird. In order for the shell to protect the exposed limbs and head, the shell had to engulf the limb girdles. The rib cage had to actually grow over the pectoral and pelvic girdles. Think about that for a minute. Take a look in the mirror sometime and see how your arms are placed. Our arms, and the arms of every other tetrapod alive today, are set outside the rib cage. In fact, we actually can (and do) rest our arms along the outside of our ribs. Turtles can’t do that. Having one’s ribs on the outside can really hamper the ability to move the arms. The arms can extend, but they cannot bend without banging into the ribs. In order to fix this, turtles had to reverse the way their arms bend. 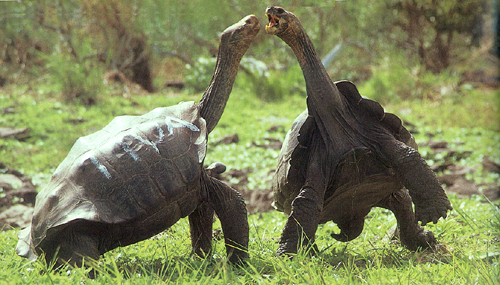 Turtle arms bend towards one another, rather than away as they do in all other tetrapods. Imagine if your arms bent like your legs do, and you get the idea. Protection of the head required another unique innovation. Namely, turtles had to become double jointed. Turtle neck articulation follows a standard “ball and socket” arrangement that is widespread among various extant reptiles. However, within each species there is between one and two vertebrae that feature a “ball” on both sides (Romer, 1956). This biconcavity creates a hinge joint that can bend a full 90°. It is this special joint, more than anything else, that allows turtles to contort their necks in such a manner. For pleurodires, as the name implies, this articulation allows the neck to be tucked to the side of the body under a lip of the carapace. For cryptodires, these double joints allow the head and neck to literally go inside the body cavity; something no other tetrapod can do, and something that is decidedly weird. 🙂 Another issue with having a shell composed of fused ribs and vertebrae, is that flexibility is reduced to zero. This has a huge effect on speed. Turtles cannot extend their stride by bending their spine; a behaviour that all other tetrapods are capable of . The only way to increase stride length is to increase the lengths of the limbs. This puts an immediate limit on turtle speed. While longer limbs could be evolved, they would not be able to fit inside the shell. The only way for a turtle to go faster is to speed up the stride frequency. Turtles were thus forced to give up on ever being speedy. Though there are some chelonian members (e.g. my Terrapene ornata luteola) which put that statement to the test. Yet another weird characteristic of turtles is how they have circumvented the issue of breathing while encased in armour. Normally, in tetrapods, breathing is achieved through the bellow like pumping of the lungs. This is accomplished by muscles connected to the ribs. These muscles expand the ribcage, allowing air to enter. As turtles no longer had the joints that allow the ribs to move, they lost the muscles that moved them. This creates a problem unique to turtles. How does one get air both in, and out of the body cavity. This is a problem that seems to have been solved multiple times in turtle evolution. Tortoises can “rock” their pectoral girdles back and forth in order to pump the lungs. Many semi-aquatic turtles can use the buoyancy of water to push air out of their lungs, while others can use the weight of their viscera to pull down on the lungs and allow air in. Many, though, have evolved sheets of muscle connected to the lungs, which will either expand, or contract the lungs and allow for respiration. Some, such as box turtles (Terrapene) require a sheets of muscle that will both expand and contract the lungs. In these animals, both inhalation and exhalation, are an energetic process. The upshot to this, is that by having independent muscles for respiration, box turtles are able to breathe even when fully sealed inside their shells (Landberg et al, 2003). One strange aspect of chelonians that is rarely brought up, is how incredibly diversified they are. If turtles had died out at the end of the Mesozoic, and all we had to go on were fossils, I doubt we would ever have realized just how “flexible” the turtle bodyplan actually is. Despite being encased in a shell both above and below, turtles are capable of chasing down prey (e.g. Trionyx and Apalone). Some are adept excavators; making extensive burrows that can run as long as 9 meters (30ft) and be 3.6m (12ft) deep (Gopherus agassizii). Still others like pancake tortoises (Malacochersis tornieri) are proficient rock climbers. Probably most surprising are musk turtles (Sternotherus). These normally waterbound turtles are quite adept tree climbers. Sternotherus minor has been observed scaling cypress trees up to 2 meters (Orenstein, 2001). Both of these species have relatively small plastrons which give them added flexibility. Still, even stiffened tanks like Leopard tortoises (Geochelone pardalis ) have been observed scaling fences that were blocking their way. The animals would climb up one side and then just topple over the other (Orenstein, 2001). Some, such as the big-headed turtle (Platysternon megacephalum) have evolved huge heads with strong jaws for crushing shellfish. Others are efficient filter feeders (Podocnemis unifilis); sieving the water of small food particles. Many freshwater turtle species have re-evolved ?gills.? These are areas of thin, permeable skin usually around their cloaca. This allows these species to take in oxygen through the water. Lastly, turtles don’t grow old (Congdon, 1992). Unlike most other animals, turtles show little to no signs of age related deterioration. 74 year old three toed box turtles (Terrapene carolina triunguis) were found to be just as reproductively active as turtles some 40 years younger than them. (Miller, 2001). So chelonians are weird, but how did they come to be this way? For that, you’ll have to stay tuned. Extra geek points to folks who got the reference to the Partners in Kryme song from the first TMNT movie. Id est: the original turtle rap. None of that Vanilla Ice crap. Congdon, J. 1992. Senescence in Turtles: Evidence from Three Decades of Study on the E. S. George Reserve. Senescence in Organisms in Natural Populations. American Association of Gerontologists. Washington, D.C.
Landberg, T., Mailhot, J.D., Brainerd, E.L. 2003. Lung Ventilation During Treadmill Locomotion in a Terrestrial Turtle, Terrapene carolina. J.Exp.Biol. Vol. 206: 3391-3404. Miller, J.K. 2001. Escaping Senescence: Demographic Data from the Three-Toed Box Turtle (Terrapene carolina triunguis).